Tiger Zinda Hai continues its dream run at both domestic and worldwide box office. After having entered the Rs 100-crore club at the domestic market in just three days, the spy-thriller has crossed Rs 200-crore mark at the worldwide box office on its fourth day. 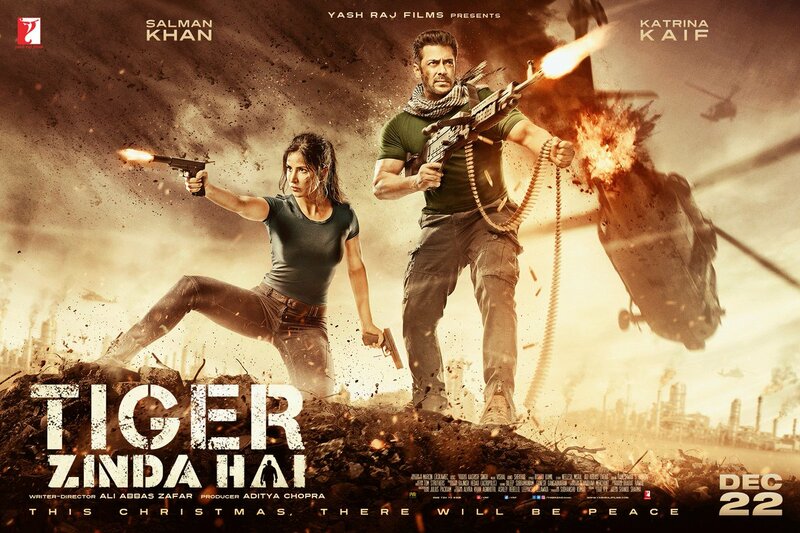 Starring Salman and Katrina Kaif, Tiger Zinda Hai collected Rs 34.10 crore, Rs 35.30 crore and Rs 45 crore at the domestic box office on its first, second and third day, respectively, thereby bringing its total Indian box office collection of Rs 114.93 crore net at the end of its first weekend. On its fourth day, it is estimated to have made a big business of around Rs 45 crore, given that Monday (December 25) was a holiday. With this, Ali Abbas Zafar directorial has made a total collection of Rs 159.93 crore net (approximately) at the domestic market in four days. Its domestic gross total at the end of its fourth day now stands at Rs 190 crore (approximately). In the overseas market, Tiger Zinda Hai registered approximately collected USD 6.75 million (Rs 43.21 crore) in its opening weekend, Bollywood Hungama reported. The film is expected to have collected another USD 2 million (Rs 12 crore) on Monday (Day 4). Hence, it did a business of Rs 55.21 crore gross at the overseas market in four days. Going by this, Salman’s Tiger Zinda Hai has registered approximately Rs 245.21 crore gross (Rs 190 crore + Rs 55.21 crore) at the worldwide box office in just four days of its release. Meanwhile, Tiger Zinda Hai has become Salman’s 12th movie to have crossed Rs 100-crore mark at the Indian box office. In fact, Salman is the only Bollywood superstar who has 12 movies in the Rs 100-crore club. Among these 12 films, Bajrangi Bhaijaan is the biggest grosser with a lifetime domestic earning of Rs 320.34 crore. He has two films crossing Rs 300-crore as Sultan had collected Rs 300.45 crore.